Being good is so hard. Thursday afternoon, I happened to look out the front door, and lo and behold, what did I see? Not all of the ducks playing in the pond. . . well, there were a couple of them in there. 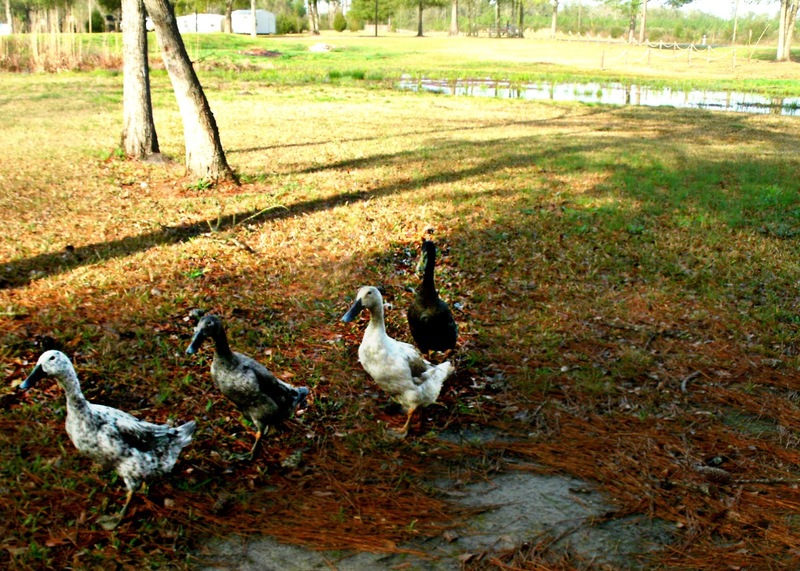 No, instead, all I could focus on was four of our usually obedient ducks being very naughty. You see, we have the catfish pond, which is quite large – more than large enough for the ducks and the geese when they decide to visit it. Then, at the very edge of our property is a small creek (really, it’s more of a marshy area, but calling it a creek sounds so much better). This creek is very close to the busy highway that runs along part of our property, and we haven’t put up any fencing along that section, yet. A panorama shot of the pond and hillside. To even get to it takes an awful lot of trouble. First, they have to walk down the hill. Then, bypass the pond and cross the garden bridge. Trek all the way past the doe pen, the in-between pen, and the buck pen, until they make it to the edge of our land and the creek. So, of course, not wanting my ducks to wander out into the road while a car was passing by, I jumped on Big Red, the UTV, and raced down the hill to make sure the ducks understood the farm rules (i.e., that they are not allowed to play in the creek so close to the road). Well, they must have known they were in trouble because they meekly met me several yards from their new found swimming hole softly quacking the whole time. I imagine in duck speak they were promising to never, ever do that again. with the creek in the background. 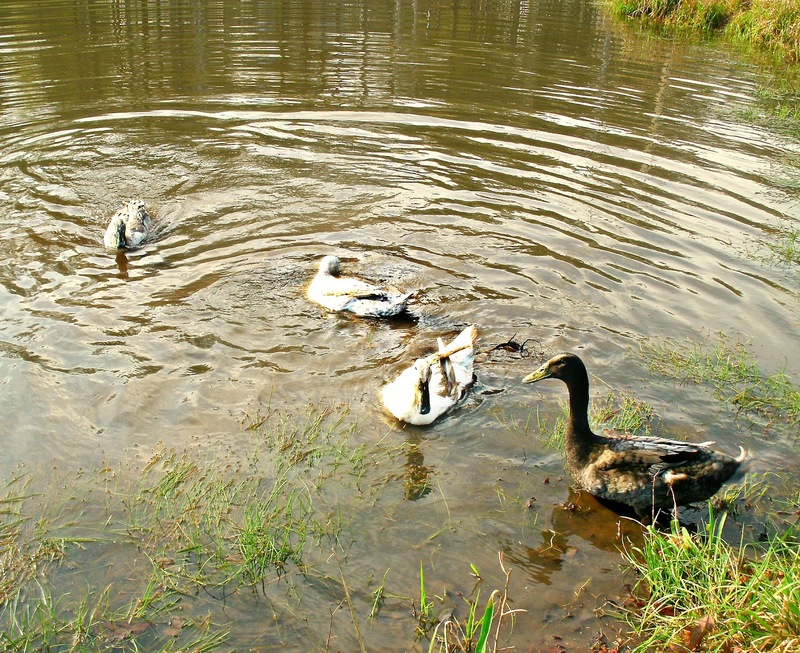 After a little coercion and begging from me, they happily followed me back to the pond. I guess I’m going to have to keep a closer eye on them from now on out. Speaking of the creek, I wanted to share this picture. It was taken early Friday evening, during a lull of the severe storm that was passing through. When I had come inside an hour earlier the creek looked the same as it did the day before when the ducks went on their excursion. With the heavy rain, it quickly swelled to more than double its size. The last time that happened was in 2009, and it, along with water from our pond and our neighbors’, eventually wound up covering the road and the police had to place two patrol cars there to caution drivers. 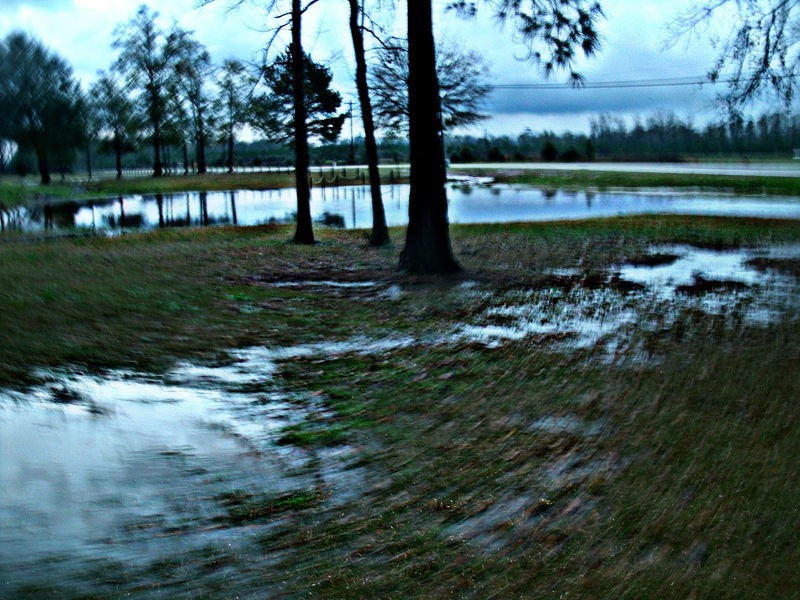 Thankfully, that didn’t happen this time and the water receded after the rain slowed down. The ducks look a bit shame-faced in the first picture – and so they should!